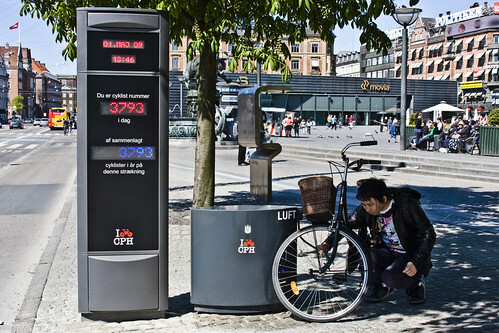 The City of Copenhagen launced this bicycle counter yesterday, on May 1st, 2009, on the City Hall Square. Complete with an air pump for your convienence. Yes, it's free. It's so new that not even 4000 cyclists have passed by. I was number 3781, by the way. Another will be set up on Dronning Louise's Bridge in June - the busiest bicycle street in the nation. There is a 'sensor line' in the asphalt on the bike lane a few metres in front of the counter which registers the cyclists. There is a SIM-card in the counters so the information is automatically sent to the City of Copenhagen's Center for Traffic. The counter only registers cyclists on this side of the street, not the far side, so you can double the numbers up to see how many cyclists use both directions. There are two numbers on the counter. Total so far today and total so far this year. This is also the first bicycle pump in the city and five more are on the way. - At 4 Metro stations: Islands Brygge, Lergravsparken, Vestamager and possibly Ørestad. It's Not About Being #1 - It's About Being #500,000. The City of Copenhagen is going to give away a free Biomega bicycle to cyclist #500,000. On this side of this street - Hans Christian Andersen Boulevard - there are about 12,000 cyclists a day [25,000 on both sides each day], so that means in just a couple of months someone gets a new bike. There will be a photo finish, in case it's close. These daily numbers from certain streets in Copenhagen put the bicycle traffic in perspective.